Henry Fonda stars as the skipper of an American fishing crew in Alaska, circa 1890, whose best buddy (George Raft) deserts him for some villainous Russian poachers, led by Akim Tamiroff. It's an entertaining action adventure, with some high drama, a little romance (supplied by Dorothy Lamour and Louise Platt), satisfying heroics, and a convincing John Barrymore as a heavy-drinking newspaper reporter. 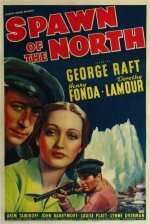 A big hit in its day and superbly directed by Henry Hathaway, with the authentic exteriors specially filmed on location in Alaska, the film spawned a feeble remake, Alaska Seas, in 1954.